Trek to Nagi village and Mohare Danda surrounded by the best view of Annapurna region is absolutely a new experience to alternative route of Ghorepani for the trekker that support Magar communities. It’s focuses to form sustainable economic stability by encouraging tourism potentialities and possibilities in this area. Exploring the unknown region, trekkers can enjoy the wonderful culture, nature, welcoming people and spectacular view of the longest chains of mountains. Mohare Danda 3300m is the closest point to view the massive Annapurna and Dhaulagiri ranges. The Mohare Danda trekking is the perfect alternative of the overcrowded Ghorepani Poonhill trekking. Mohare Danda is the high road alternative to the Ghorepani trek, and follows an alternative trail up from Pokhara itself up to Banskharka, along to Nangi and Mohare. The treks are along scented forests of oak, rhododendron and spruce and sometimes along exposed ridges that offer exhilarating views of Dhaulagiri, Annapurna south dead ahead and the forked summit of Machhapuchhare to the east. 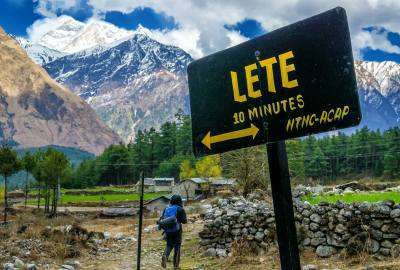 You have a long circuit lasting a week to Dhankharka, or you can do a shorter five days version fast tracking through Tikot or either ending your trek at Patichar via Lespar. Mohare Danda trek for developing a unique concept of eco trekking that benefits the environment and development of the area. 5 - 7 Days trekkeing itinerary. All airport shuttles by private car or van as per group size. One porter between two travellers. All meal: breakfast, lunch and dinner during the trek. Lodge accommodation during the trek and group first aid kit. All ground transportation during the trip in Nepal. All necessary trekking permits and fess while in trekking. Food, accommodation and salary of your guide and necessary porters. Accommodation, transporatioan and meals in Kathmandu and Pokhara. Laudry, phone calls and internet etc.